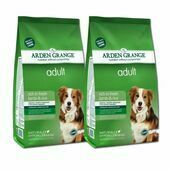 A complete dog food for adult dogs with a normal activity level, this special blend of fresh salmon and rice is perfect for dogs with sensitive skin or digestive difficulties. Along with the healthy and nutritious fresh salmon and whole grain rice, it contains a carefully balanced ratio of Omegas 3 and 6 and other minerals and vitamins to encourage a healthy diet. 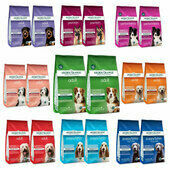 Suitable for dogs with sensitivities, intolerances & allergies. 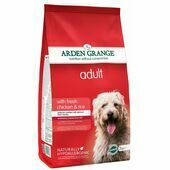 All Arden Grange dog food recipes are naturally hypoallergenic and free from ingredients that contain allergens which may disagree with a dog’s digestive system, such as wheat gluten, dairy products, beef and soya. They also contains no GMO ingredients and no artificial preservatives, colours and flavours. 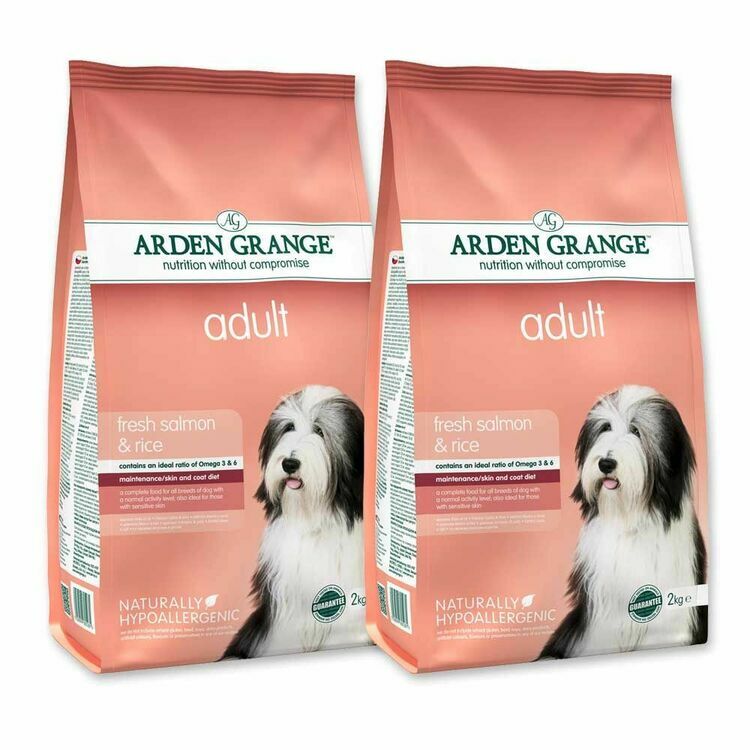 Suitable for all adult dogs, Arden Grange Salmon & Rice is a wholesome, easily digested dry dog food that has been specially formulated to meet the physical demands of adult dogs from all breeds. 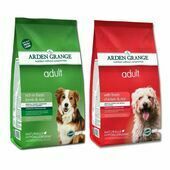 Most importantly, this dry dog food provides a delicious and nutritionally healthy diet for your pet. 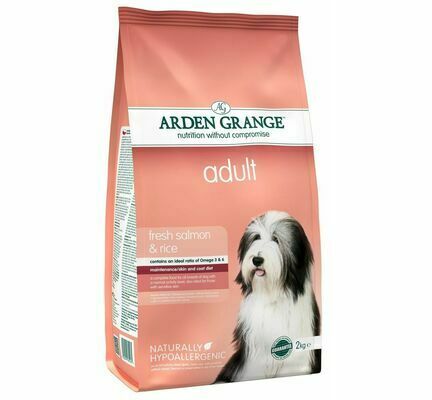 Ingredients: Fresh Salmon (min 26%), Whole Grain Rice (min 26%), Chicken Meal*, Whole Grain Maize, Chicken Fat*, Beet Pulp, Dried Brewers Yeast, Egg Powder, Fish Meal*, Linseed, Fish Oil*, Minerals, Vitamins, Nucleotides, Prebiotic FOS, Prebiotic MOS, Cranberry Extract, Chondroitin Sulphate, Glucosamine Sulphate, MSM, Yucca Extract. * Preserved with mixed tocopherols and rosemary extract. 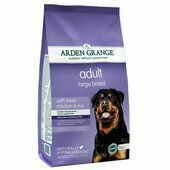 As an independent, family-owned company, Arden Grange have been making premium pet food for over 20 years and specialise in creating delicious pet foods that are not only nutritionally balanced, but also free from common allergens such as wheat, beef, soya & dairy. 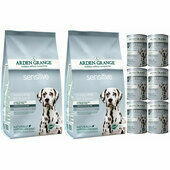 The hypoallergenic dog food recipes used by Arden Grange allow their meals to be enjoyed by all dogs, irrelevant of allergies or their body's inherent sensibilities, and every single ingredient used has been sourced from sustainable stocks that can be traced back to their place of origin. Rich in antioxidants, prebiotics and essential vitamins and minerals. Fantastic service both delivery and producted. Excellent product no issues with change over from previous food to this. 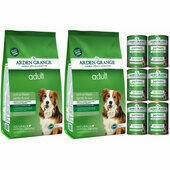 We have a rescue GSD with a very sensitive constitution and it took us a little while to find a dog food that would agree with him. 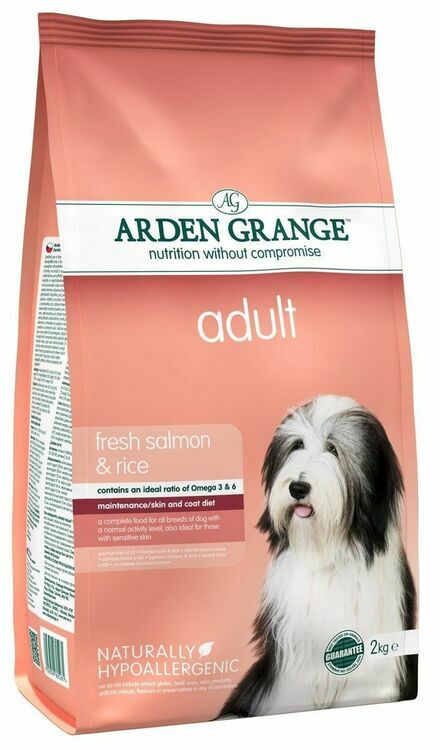 He's generally not good with meat - chicken, pork - so the Arden Grange salmon and rice is perfect and also gives him a lovely shiny coat! 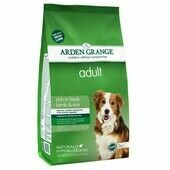 We pair it with the Arden Grange white fish wet dog food from their partners range and he absolutely loves it. 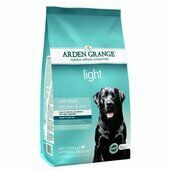 We can't recommend this dog food enough! Delicious...or so my dogs tell me! My dog has a 'sensitive tummy' and this has restored him back to health...and he loves it too!